Brains-O-Blog! : Adam Leith Gollner's book "The Fruit Hunters", inspiration for the song "Ba-na-nas"! Adam Leith Gollner's book "The Fruit Hunters", inspiration for the song "Ba-na-nas"! How many different types of fruits are in our supermarkets? 10? 20? Hmmm… lets see: Apples, oranges, bananas, pears, plums, watermelon, pineapple, peaches, strawberries, cherries, lemons, limes, grapefruits, grapes, mangoes, kiwis, raspberries, blackberries, apricots, cantaloupe… well that’s 20. Can you think of more? I bet you could if you tried, but how many more? 20 more? What if I told you that there are thousands more edible fruits out there??!! It’s true! I look over that list of 20 fruits and my mouth starts to water with their vast diversity of flavors, textures, shapes and colors. Imagine thousands more! Adam Leith Gollner’s book The Fruit Hunters helps us to do just that. He takes us around the world to meet the fruits that aren’t part of the commercial food chain, as well as all the cool, crazy people who are getting fruity about fruits just like we are here on the Brains-O-Blog! For me what is most special about this book is the magical attitude Adam takes towards fruits. His writing shows us to really see the wonder in fruits; how weird they are, how tasty they are, how they have enchanted people for centuries and continue to do so. We leave the book feeling joyous about life itself. Fruits become a concept greater than their individual tasty selves, and they invigorate us to the richness of this planet all around us, both under our noses and in all the places we’ve yet to explore. 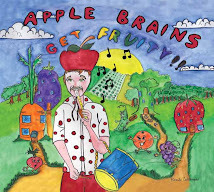 The Fruit Hunters helped teach me to appreciate the beauty of life through the lens of fruits, no joke!, and also directly inspired the Apple Brain’s song, “Ba-na-nas”. “Ba-na-nas” is about how we take bananas for granted here in the United States, yet they are one of the thousands of fruits that doesn’t actually grow well in our country. We are familiar with them because they happen to be a part of the global commercial food industry, and so get shipped to us from far away. We need to be thankful of the hard work that brings bananas to our shores, and they can also serve to remind us of the wonderful diversity in the world. When we eat a banana we can think, “I wonder what else there is? Out beyond where I have been? So many fruits so many things, oh what could be? I wanna see all of the diversity all around me!” These are some of the lyrics of “Ba-na-nas”. So thanks Adam for a great book, and from now on every time you eat a banana remember to think about all the other amazing things out there, fruits and otherwise, just waiting for you to discover. AND you can start the adventure with bananas themselves! After all, there are hundreds of types of edible bananas, and in countries where they grow people can often choose between dozens of varieties! Three cheers for biodiversity! And human diversity as well! You can learn more about Adam Leith Gollner and his book, The Fruit Hunters, at www.adamgollner.com. Also check out this facebook group for the book.